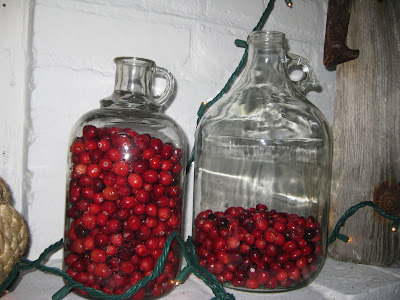 Cranberries in antique jugs I collect. The smaller one is my most recent acquisition. 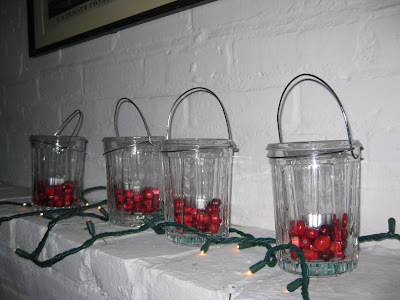 I love tea lights and these jars are just too cute! I found them on sale one summer in a little shop on the North Shore of Boston! Another door and my favorite swag! 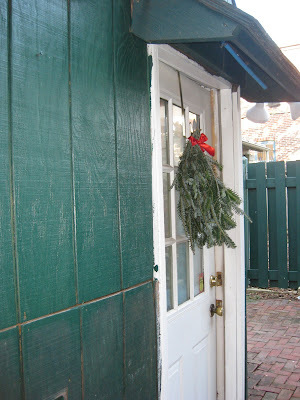 The last door and a wreath I made to try and replace the one that was damaged. It is cute, but doesn't quite cut it! View as soon as you walk in. Note: The beautiful mirror is from my friend Julie's company, Simple Reflections. Our tiny kitchen table (doesn't even fit in our kitchen). The runner is from our friends who live overseas and the centerpiece is from my work Christmas party! They were going to throw them away so I snagged it! This is the first year our tree has been taller than us! 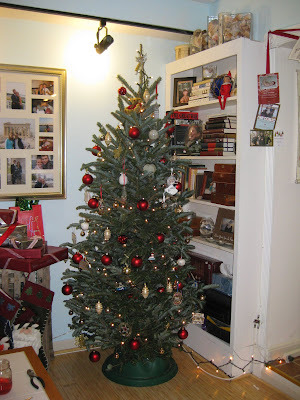 If you look closely you can see ornaments we have collected over the years: White House Ornaments, a pineapple from Jefferson's home in Monticello, a light house ornament from our honeymoon and many other ornaments filled with memories. 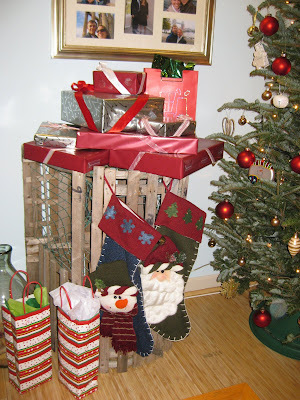 Last, but not least, our lobster trap (which holds our stocking since we don't have a fireplace). The trap became the perfect place to hold our wrapped gifts! Thanks so much for the link to Bibs & Cribs! I love your lobster trap/stocking holder! So creative! =) Merry Christmas! 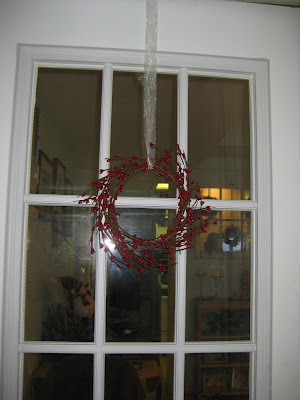 I love you wreaths and swags... they are so lovely. 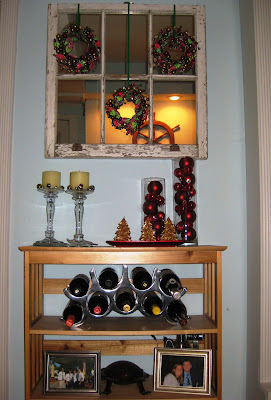 I think my favorite is that mirror in your entry way with the little wreaths hanging in it. You have a lovely home, thanks so much for sharing and Merry Christmas! Oy! Friday has come and gone. We seriously blinked our eyes and we missed the chance to post for your amazing virtual house tour. But we just had to drop in and marvel at all the festive and fabulous holiday touches here and there and everywhere that you linked! Thanks so much for the heads up about the tour. Everyone needs a little eye candy on a Saturday morning! lovely! The cranberries you used were fabulous. were they fresh? I have a couple bags in the fridge, maybe I'll get them out and pile some in vases! love it!!! 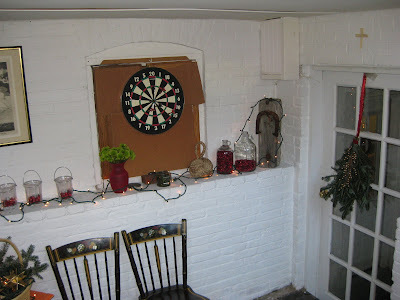 :) our apt is all set for christmas... will post a few pics on my blog... :) we have a "swedish" tree this yr from a farm in essex... i love your decorations... hope all is well!! Thanks for linking to my blog! 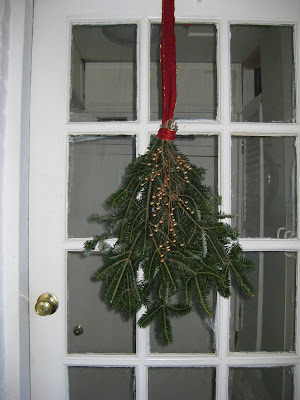 Your decorations look awesome. 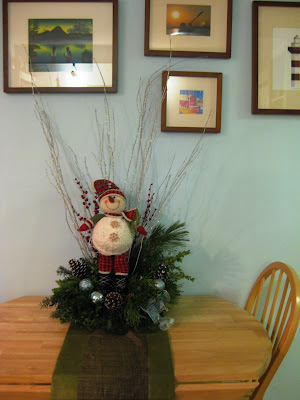 I love the cute snowman in the centerpiece. Good think they didn't throw it away it looks great on your table. Love the lobster trap. Cute idea! Thanks for the beautiful holiday card. You guys look great!